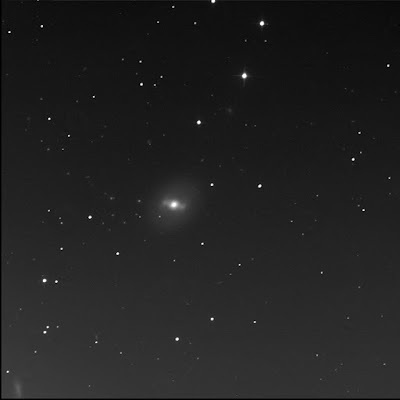 The BGO robot tried to image NGC 936 for me but an error occurred. BGO said "likely clouds" but I bet it was the brightening sky. Dove deep to ID the faint fuzzies. 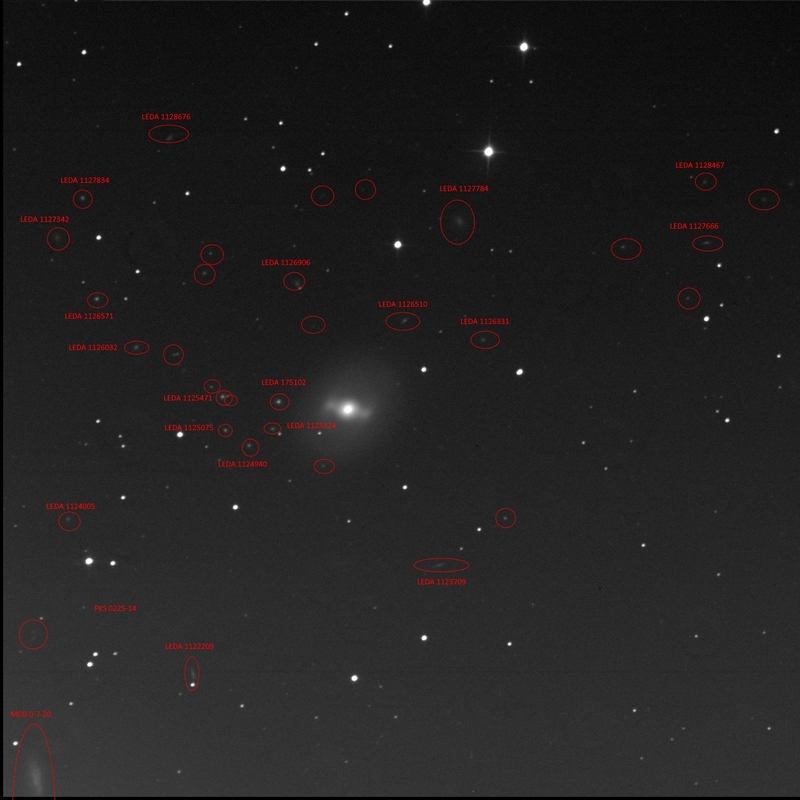 With the help of SkyTools 3 Pro, I labelled a bunch, about 20 objects! Working clockwise from 12. Mostly galaxies. LEDA 1126510. Canted galaxy to the north-north-west of NGC 936. LEDA 1127784. A very faint large object beyond 1126510. LEDA 1126331. A small amorphous fuzz ball to the north-west. LEDA 1128467. A small faint oval to the north-west. LEDA 1127666. An elongated wisp to the north-west. LEDA 1123709. A long thin edge-on special galaxy to the south-west. LEDA 1122209. Another long thin smudge, to the south-east. MCG 0-7-20. A very large galaxy to the south-east. A curious shape. Cut-off on the edge of the image. Quasar PKS 0225-14. Bright. Magnitude 18.6 in V. Redshift (z): 2.04. Light Time: 8.9 Gyr. LEDA 1124005. Nearly round medium size fuzz to the east-south-east. LEDA 1124940. Bottom of a pentagon of fuzzies close to and east of 936. LEDA 1125075. Bottom-left of a pentagon of fuzzies close to and east of 936. LEDA 1125124. Bottom-right of a pentagon of fuzzies close to and east of 936. LEDA 1125471. Top-left of a pentagon of fuzzies close to and east of 936. Somewhat bright. LEDA 175102. Top-right of a pentagon of fuzzies close to and east of 936. Quite bright. LEDA 1126032. Round fuzzy to the east-north-east of 936. LEDA 1126571. A bright but small lint ball to the north-east of 936. 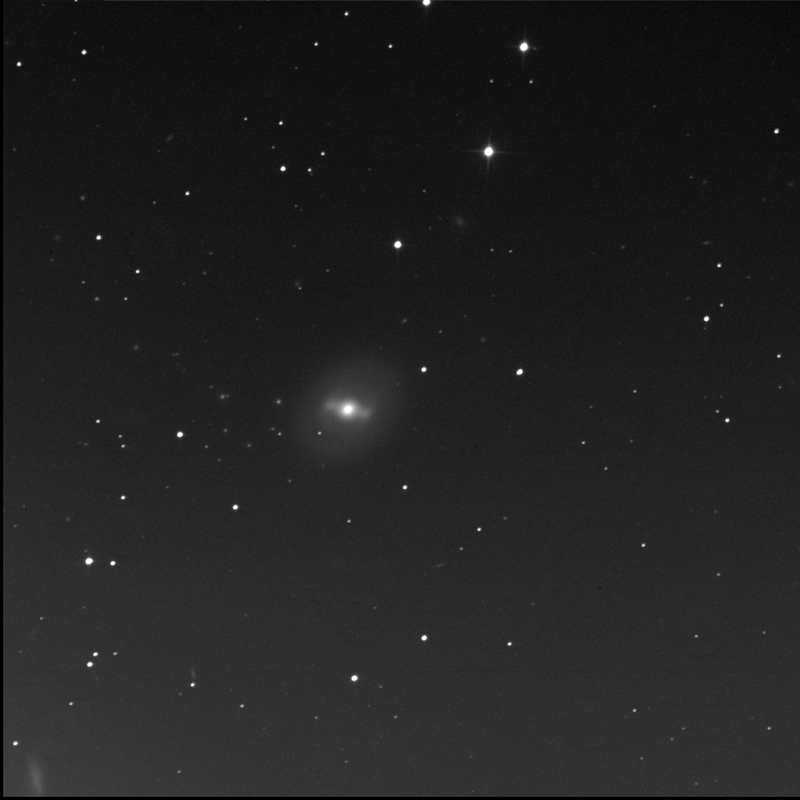 LEDA 1127342. A very faint diffuse object to the north-east. LEDA 1127834. Round fuzzy to the north-east. LEDA 1128676. Very faint oval to the north-north-east. LEDA 1126906. Medium size faint round fuzzy to the north-north-east. I circled a half-dozen other things in the image. Not identified at this stage. Imaged it again on 12 September and received all the LRGB data.